Every month we will have a DVD title reduced in price. Whether it be a review or training title, take advantage of the special price. In the first of a progressive series of programmes Richard Davison sets out the fundamental principals of good dressage with the help of training pupils and his wife Gillian. Says Richard "Horses go as well as we ride them; Dressage is Horse gymnastics and riders require self discipline and control - this may sound serious and it is but you can also have lots of laughs along the way." Approx. 86 mins. Part 2 of the popular Enjoying Dressage with Richard Davison series is an easy to learn guide which everyone will find easy to watch and understand. Richard gives a masterclass on the rider's seat, getting structure to your training session, how to get an uphill canter and spring into flying changes, assessing the young horse and extra curricular training. With practical advice and clearly demonstrated exercises, Richard's methods will really make a difference to your training. Approx 75 minutes duration. Flying Changes with Richard Davison. DVD. Every Dressage, Show Jumping and Event rider knows flying changes are essential to their sport. In this DVD, triple Olympian Richard Davison carefully explains and demonstrates how to build towards, and perfect, the flying change. Approx.60 mins. Double Olympian International Dressage rider Richard Davison, is joined by show jumping legend John Whitaker and his son Robert for 90 mins. 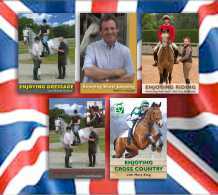 of fascinating and comprehensive instruction on the flat and over jumps, as Richard's dressage expertise is moulded with the Whitakers' jumping prowess. Approx. 85 mins. Laura works her six-year-old, Dankeshoen (Dan) at home in three different sessions over a four month period including, Warm Up to Collection, De-Mystifying Lateral Work and The Start Of Piaffe. Approximately 58 minutes. Laura takes us from one end of the training spectrum to the other, working with her four year old Stepdance (Step), then showcasing her Grand Prix horse and Olympic partner Mistral Hojris. Approximately 60 minutes. 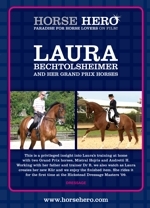 A privileged insight into Laura's training at home with two Grand Prix horses, Mistral Hojris and Andretti H. Laura develops her new kur and the finished item is excellent viewing. Approximately 60 minutes. The Bechtolsheimers start their youngsters on the ground and under saddle. 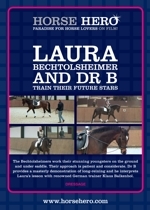 Dr B provides a masterly demonstration of long-reining and interprets Laura's lesson with German trainer Klaus Balkenhol. Approximately 64 minutes. 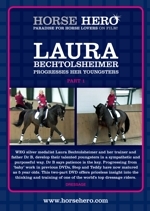 The four DVD series comprises: Laura Bechtolsheimer Works With Youngster Dan; Laura Bechtolsheimer - The Baby and the Finished Horse; Laura Bechtolsheimer and her Grand Prix Horses; and Laura Bechtolsheimer and Dr B Train Their Future Stars. Laura and her trainer Dr B develop their talented youngsters in a sympathetic and purposeful way. Part 1 covers progressing from 'baby' work with 5 year olds Step and Teddy through lateral work and focussing on balance. 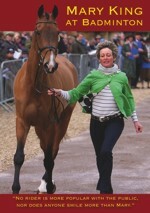 This two part DVD offers a priceless insight into the thinking and training of one of the world's top dressage riders. Each part is approximately 60 minutes in duration. 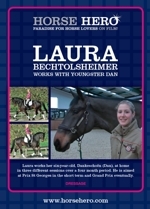 Laura and her trainer Dr B develop their talented youngsters in a sympathetic and purposeful way. 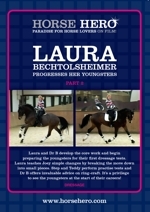 In Part 2, Laura and Dr B develop the core work of their youngsters and prepare them for their first dressage tests. 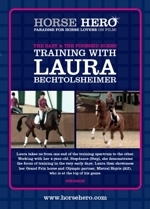 This two part DVD offers a priceless insight into the thinking and training of one of the world's top dressage riders. Each part is approximately 60 minutes in duration.